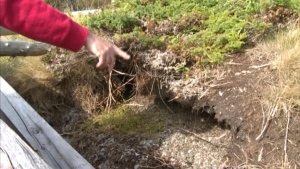 One of Newfoundland and Labrador's oldest known archeological sites is under threat. Historic settlements on the Eastport Peninsula are eroding quickly, but there's little money or manpower to stem the tide. Coastal erosion is eating away at the shoreline where a number of Beothuk homes were discovered. About 20 to 30 centimetres of the shore has disappeared in the last few years, and the erosion has archeologist Laurie McLean concerned. "By the time I get back here next year, this is not going to be here, right … and any artifacts that are contained within here are going to be wherever," said McLean. The artifacts come from six distinct cultural groups which called the shoreline home over several millennia, including the largest known coastal Beothuk settlement. Most of those Beothuk sites are either lost or about to be lost. The last dig was five years ago, and since then McLean and the Burnside Heritage Foundation, which he works for, haven't been able to get the grants needed for more excavation. "I've made annual trips here since then and we've patched up some of the structures, but basically it's been myself and one person, one volunteer pretty much, and we can't keep pace with it," he said. In the past, McLean and the foundation used money from federal and provincial job creation programs, training locals to build retaining walls and assist with digs. At times there were a dozen people on site. This past summer, McLean said there was only himself and a summer student, spending most of their time staffing the group's museum. "We haven't been able to bring them back on a regular basis, and they've had to move on to other employment. In the last couple of years it's hard to get anyone, without the grants we normally relied upon. It's hard to know where to go next," McLean told CBC. "This is the kind of stuff we're losing along the bank. The details of a 5,000-year occupation … and who knows what you're losing? Technological innovation, spiritual things." With the digging season now over, McLean said he will spend the winter months applying for grants, hoping that more funding comes through to save what little is left. Erosion threatens more than 130 coastal sites in the province, including those of at least five distinct aboriginal peoples over five millennia. Ottawa and the provincial government have set aside $400,000 to perform risk assessments of threatened historical sites, including the Beaches and Bloody Bay Cove sites in Bonavista Bay. Bruce Hynes, chair of the Burnside Heritage Foundation, said the potential funding is encouraging news. But he said there are so many historical sites chasing government money, tourism potential often takes priority over archeological merit. "You could have a gold mine of archeological artifacts in an area. But if people aren't travelling by there you might as well just not have it," he said. "The bigger centres get the bigger money." According to Hynes, without the money to maintain infrastructure at the sites, they will quickly disappear. "Unless we can preserve the remaining house pits and the sites and maintain some sort of infrastructure of a museum, a gift shop, trails, walkways, steps ... it's simply a means of raising funds to protect the rest of it," he said. "And without those funds, we're lost. Once that infrastructure is gone, it'll take 20 years before the elements take care of it." The provincial government is working with Memorial University on evaluating the 130 at-risk sites on the island portion of the province to assess the risk of erosion. "The project involves developing a risk assessment model related to coastal archeological sites to generate site-specific recommendations, and assessing potential management options for at-risk archeological site protection and disturbance mitigation strategies," Tourism, Culture and Recreation Minister Terry French said in a statement. French said one of the areas they will be focusing on is Bonavista Bay. "Several areas have been selected for heritage management case studies, based on sea level history, type and severity of coastal disturbance, and Bonavista Bay is one of those areas, which includes the Beaches site." According to French, there are more than 1,800 recognized archeological sites on the island alone, and 108 known Beothuk sites.